Tuesday the 10th of December at 5.15 in the Lunchroom in Museum Place. 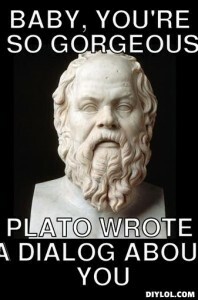 This time we are going back to basics and will be talking about Plato and Aristotle. If you’d like to participate, you should look up Plato’s “The allegory of the cave” and “The Republic” (Do not confuse with “One Republic”!!!!). Looking forward to another lively discussion on Tuesday! This entry was posted in Calender and tagged Philosophy Group on December 6, 2013 by Grace Krause.